In 1961, the American people were reeling after the Soviet Union landed the first major blow of the Space Race. The Soviets had successfully launched the first satellite in human history into orbit with Sputnik. In response, President John F. Kennedy proposed an ambitious national goal for the country to achieve before the end of the decade. In a speech to the nation, he proposed that the nation dedicate itself to “landing a man on the moon and returning him safely to the Earth” before the decade was out. On July 20, 1969, the crew of Apollo 11 touched down on the surface of the moon in the Eagle lunar lander and returned to Earth four days later to achieve President Kennedy’s goal. 2019 marks the 50th anniversary of this crowning achievement in the Space Race. 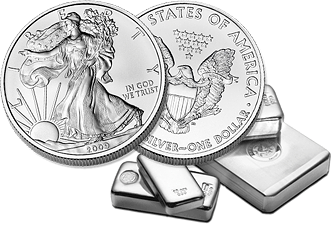 You’ll find a variety of commemorative 50th-anniversary silver bullion products available to purchase online at Silver.com. The Apollo 11 mission launched from Kennedy Space Center on Merritt Island, Florida, on July 16, 1969. The mission module consisted of a command module unit, support module unit, and the Eagle lunar landing module. The spacecraft was powered into orbit by Saturn V rockets and marked the fifth crewed mission in NASA’s Apollo program. The crew of Apollo 11 included three men. Michael Collins served as the pilot of the command module and was the only man in the crew not to set foot on the surface of the moon. Neil Armstrong was the mission commander and was accompanied to the moon’s surface by Eagle landing pilot Buzz Aldrin. Armstrong was the first human being to ever set foot on the surface of the moon. After six hours in the Eagle lunar lander, Armstrong emerged down a ladder to step onto the surface of another celestial body for the first time in the history of mankind. He was later joined by Aldrin and the two spent nearly three hours outside the spacecraft exploring the moon’s surface and would spend 21.5 hours in all on the moon’s surface. After 8 days, 3 hours, 18 minutes, and 35 seconds in space, the crew of Apollo 11 splashed down in the Pacific Ocean and were recovered by a specialized crew from NASA and the United States Navy. Eagle Landing: Four days after departing Kennedy Space Center, Armstrong and Aldrin descend onto the moon’s surface in the Eagle lander on the obverse of this round. Touching down in a region of the moon known as the Sea of Tranquility, Aldrin and Armstrong report back to Houston “Tranquility Base Here … The Eagle Has Landed.” The date of the moon landing is also featured. 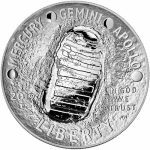 One Small Step: On the obverse of this design, you’ll see Armstrong descending the steps of the Eagle lander to mark the first time human beings have landed on another celestial body. As he steps onto the moon, Armstrong proclaims “That’s One Small Step for Man, One Giant Leap for Mankind.” The timing of his first steps onto the moon is also engraved on the rim. Moment of Silence: During their moonwalk, Aldrin requested a moment of silence as he took in the majesty of his position high above in the cosmos as human eyes looked directly down on Earth from above. Aldrin stands in the Sea of Tranquility on July 20, 1969, with Earth visible in the distant background field. Earthbound: Aldrin and Armstrong used the Eagle landers rocket boosters to return from the moon into orbit and rejoined Collins in the command module. The three-man crew jettisoned the Eagle lander and powered up the boosters on the command module to slingshot around the moon and return home to Earth. Splash Down: The final obverse design in the series depicts the moments after the landing pod had reentered Earth’s atmosphere and splashed down in the Pacific Ocean. Here, the crew is met by a team of US Navy and NASA rescue specialists. The engraving rim includes the longitude and latitude coordinates where the pod splashed down in the ocean. 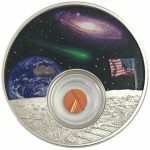 Jamul Sovereign Nation: The 2019 1 oz Proof Silver Jamul Moon Landing Curved Coin features a domed reverse side with a colorized design depicting planet Earth. There is a black line representing the flight path of Apollo 11 from Merritt Island, Florida, to the Sea of Tranquility on the surface of the moon. The concave obverse includes the image of an American bald eagle landing on the moon. Mesa Grande: 2019 1 oz Proof Silver Mesa Grande 50th Anniversary Moon Landing Coins have a colorized reverse design that includes the moon’s surface in the foreground and the darkness of outer space in the background. A comet streaks across the sky with the beautiful colors of planet Earth in the distant background. The obverse of these coins includes a bald eagle. There is a capsule included in the coin’s design with rough diamonds set within. These diamonds are the same as those rough diamonds created when comets strike the surface of the moon. Niue: In the 2019 1 oz Proof Silver Niue Moon Landing 50th Anniversary Coin release, the mint offers a colorized reverse design that has the brilliant colors of the cosmos in the background and the moon’s surface in the foreground with an American flag fluttering on the moon’s surface. The obverse features Queen Elizabeth II’s effigy in a right-profile portrait. The inset capsule in these coins includes copper taken from the Statue of Liberty during a 1985 renovation that was melted into smaller statues, both of which went into space on the space shuttle Discovery. All of the Native American Mint Apollo 11 releases have a limited mintage of 5,000 coins. Individual coins are housed in capsules and set within commemorative display boxes. The coins come with a Certificate of Authenticity as well and feature .999 fine silver content. 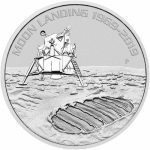 Not to be left out of the celebration, the sovereign mint of the nation which achieved this impressive feat offers its own selection of commemorative Apollo 11 coins. The United States Mint issued five primary coins with a shared obverse and reverse design. The American Apollo 11 50th Anniversary Coins include three silver coins and two gold coins. All of the coins in the US Mint Apollo 11 50th Anniversary collection are curved coins with a convex reverse field and a concave obverse field. On the reverse of all coins in the collection is a depiction of the close-up photo taken July 20, 1969, on the surface of the moon. The photo was taken looking directly at the visor of astronaut Buzz Aldrin and captures on its surface the reflection of the Eagle lunar lander, the American flag, Neil Armstrong standing between the two, and the shadow of Aldrin cast across the scene. The helmet and visor of Aldrin serve as a frame of sorts for the entire design field. The obverse of all American Apollo 11 50th Anniversary Coins includes a concave design field with the singular footprint of an astronaut on the surface of the moon. Included with it are engravings of “Mercury, Gemini, Apollo” separated by depictions of four different phases of the moon. The United States Mint strikes these Apollo 11 50th Anniversary Coins with mint marks from the production facility. The Philadelphia Mint issues the silver coins with a “P” mint mark while the West Point Mint issues the gold coins with “W” mint mark. 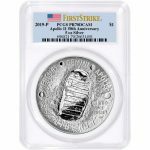 One of America’s premier private mints, SilverTowne offers its own standalone 1 oz silver round commemorating the achievement of NASA with the Apollo 11 mission. The 1 oz SilverTowne Apollo 11 Rounds are available to purchase at Silver.com with an obverse design featuring the Eagle lunar lander after it touched down on the surface of the moon. 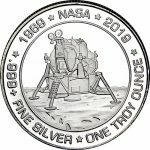 The design is accompanied by engravings of “1969 NASA 2019” along the top rocker and “.999+ Fine Silver One Troy Ounce” along the bottom rocker. 1 oz SilverTowne Apollo 11 Rounds are available in either individual packaging, mint tubes of 20 rounds, or inside of Master Boxes that include a total of 500 silver rounds. Each one has 1 Troy oz of .999 fine silver content. A half a century ago, the United States of America put two men onto the surface of another celestial body for the first time in human history and proceeded to bring them safely back home to planet Earth. In the 50 years since, no other nation has achieved this marvel. Now is your chance to own a piece of history and purchase one of your own 50th Anniversary Apollo 11 silver bullion products at Silver.com. Our customer service team is waiting to lend a hand answering your questions. Simply call us at 888-989-7223, chat with us live online, or send us an email with your inquiries.